I was born in Stoke-on-Trent on May 3rd, 1924 and grew up living at 52 Kimberley Road, Etruria. All streets of the area were built in the years following the Boer War and were given names associated with that conflict, such as Belmont, Dundee, Ladysmith and Kimberley. The houses of Pretoria Road were built in the 1930’s (and so had bathrooms). A large nearby pit mound of red ash was known locally as Spion Kop, after the hill in Natal, South Africa. We climbed it regularly for free viewing of the greyhound racing at the Sun Street Stadium. Our houses were well built in terrace style, but primitive by today’s standards. There were two bedrooms upstairs and two rooms downstairs. There was also a kitchen having a sink with one tap, a gas stove and a coal fired arrangement to heat a vessel containing water in which the weekly clothes wash was carried out, traditionally on Mondays. Each house had its’ own outside lavatory with water flush. Bathing was performed in a zinc coated metal bath, which was usually stored by hanging it on a nail in the outside wall. 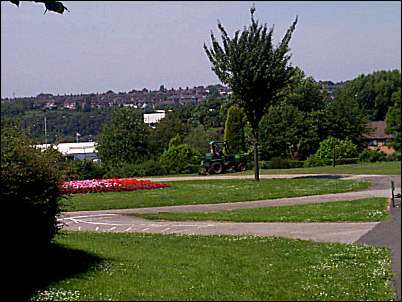 Etruria Park was adjacent to our streets and had two small playgrounds equipped with swings, seesaws and a roundabout, one ground for girls and the other for boys. There were two tennis courts and a bowling green for adults. There were also several other areas of open land, not yet built on, where we could play. When we got older the Trent and Mersey canal towpath came within bounds and fishing by net and cane for jacksharps and gudgeon was popular. Older boys fished by rod and line whilst sitting on a wall on the far bank of the canal facing the entrance to the Wedgwood factory. The ropes of the horse-drawn barges continually interrupted them because the towpath changed banks at that point. When I became 14 I spent all I had on the purchase from an older boy (Stanley Jackson) of an allotment situated where the cinema now stands on Festival Park. There I kept racing pigeons and grew a few vegetables. That same year I acquired my first second hand pushbike and outings to far away places became possible. 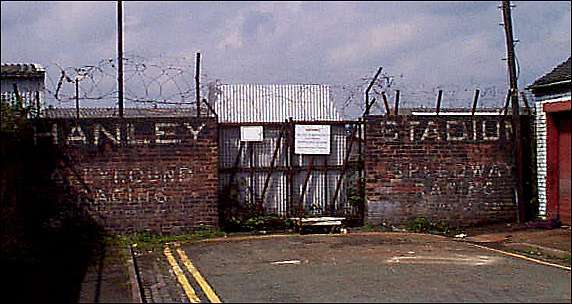 The families of Etruria were mainly employed at “Shelton Bar” (actually The Shelton Iron and Steel Company), the coalmines and the pottery industry. We were almost entirely working class and most did not have much direct experience of the outside world except, perhaps, by an annual holiday for one week at the seaside. However, many of us did a lot of reading and Hanley Public Library was often visited. Light entertainment was provided by a weekly visit to “the pictures” (the cinema). When we entered our teens and began to fraternize with girls we did so around the lighted windows of “shops” which were really converted rooms of neighboring houses. This ended suddenly with the imposition of the “Blackout” on the outbreak of war in September 1939. As I remember it, we then patronized the skating rink in Hanley for the same purpose. My memory is of growing up with nice people and although I have lost touch with most of them, I have fond memories and remember many names. Where are you now? Education started at age of 5 and was compulsory until the age of 14. The Etruria Council School was attended until 12 when pupils transferred to Cannon Street or Cauldon Road schools for completion of elementary education. I remember the names of teachers at Etruria school; Misters Taylor (head), Therwell and Horton, Misses Hill and Gill and Mrs. Hildich. Another education route was by way of competitive scholarship to a grammar school (usually called high schools in those days). For a long time there had been only two for the conurbation of Stoke-on-Trent; Hanley High School and Longton High School. Each school took in about 75 entrants each year, comprising about 60 boys and 15 girls. The new entrants at each school made up three forms of about 25 pupils, a much lower figure than in the elementary schools. Of the 75 pupil intake an average of 65 would complete the 5 years necessary to achieve “School Certificate”, usually at age 16. They would already have separated into Arts, Science or General forms at the beginning of the fourth year. Four or five pupils from Science and from Arts would stay on for a sixth and seventh year to obtain Higher School Certificate. The number of girls attending grammar school in Stoke-on-Trent was increased when Brownhills Girls High School was opened in the early ‘30s. It was increased again in 1938 when Thistley Hough Girls High School opened. This opening took away the girls from the Hanley and Longton High schools. However, this was short-lived because at the outbreak of war in the following year, a shortage of teachers and other resources brought boys and girls together again for some classes. In those days only about three or four pupils a year would obtain State Scholarships and go on to university. My father was a die fitter at Taylor Tunnicliff, Lichfield Street, Hanley, manufacturers of electrical porcelain. My mother had worked as a pottery operative before marriage but had stayed at home following my birth. That had to change when my father fell ill, consequent on service during the First World War. He died in January 1934, having spent his last six months in the Military Hospital in Mossley Hill, Liverpool. My mother had restarted work about a year earlier to provide an income. She worked as a caster at Lancaster and Sandland, Mount Pleasant, Shelton, which was a few minutes walk from our home. I became a latchkey child. I used to get home from school, light the coal fire for the evening and then stay in, play out, or go to neighbours’ homes. Very often I would go to Lancaster and Sandland (manufactures of ceramic table ware) to join my mother at her workplace. There I was able to watch her and others work. It was a small factory and over a period of time I became familiar with all that went on there. It was probably because I was a latchkey boy that I found myself with one of my schoolmates, Leonard Dunne, getting arithmetic lessons from his father, a Shelton Bar worker. He seemed to be a good teacher. We were preparing to take the “Scholarship” examination which would decide who went on to grammar school. My mother was, at this period, working long hours to keep us and fund the railway fares to Liverpool each weekend to see my father. Some people who lived near to the Military Hospital were known as “Friends of the Hospital”. One family lived directly opposite Sefton Park and I spent most of the weekends with them while my mother was with my father. Their daughter had just started teaching and gave me a lot of her time and access to her books. I looked forward to my visits there and on our last visit she presented me with a Philips Atlas, it contained diagraphs of the Universe, the Planetary System and, of course, maps of exotic sounding places. It fascinated me. Shortly after my father’s death we were told that I had passed the Scholarship Examination. I started at Longton high School in September 1934 and was there until July 1941. Mother remarried in 1938 and financial matters became much easier. By this time she had moved to a much larger factory, the Ridgway Pottery in Shelton. I again had access and was able to look and learn. This factory had a very small department making tiles for fireplaces. It was my first contact. with ceramic tiles. I left school at the age of 17 and joined Richards Tiles as a laboratory assistant. The then Technical Director, Lawrence Bullin, had graduated from Liverpool University together with Gregory who was our headmaster at Longton High School. Bullin asked Gregory for a boy and I was the person sent. I could not know then that I would become Technical Director to that company and that I would do work in many ceramic factories located in 23 countries around the world. However, I had not been at Richards for long when “call up” for military service occurred.